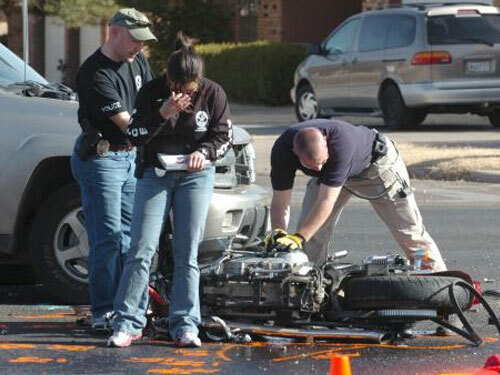 It's a situation every experienced motorcyclist knows, and the single most common type of injury-causing accident between a car and a motorcycle: an automobile driver makes a left turn in front of an oncoming motorcycle. The question of how a motorcyclist can avoid this type of accident is another topic for another time, let's first get a handle on just why drivers do this. At times the situation would appear almost as if the driver is trying to hit the motorcycle. We hear the same story all too frequently, "The driver looked right at me, looked me in the eyes, and then pulled right out in front of me anyway!" At least that's what we'll hear from the survivors. Understanding why this happens requires us to examine the mindset of the average auto driver. This isn't a matter of car drivers hating or ignoring motorcycles, we're simply not part of their daily experience or included in the search pattern of daily driving. Auto drivers learn to be on the lookout for another car or a truck, something large enough to be a threat. A motorcycle simply doesn't register. It's ignored along with the tree on the corner or the bird in the sky. The eye sees it, but the brain isn't concerned about it, so no action is required. Inside the driver's auto-response system, the situation plays out as: "Is there a car in the way? No. Left turn approved." The motorcycle was there, but so is a building, a road sign and thousands of other objects that are not perceived as interference with making that turn. Motorcyclists aren't the only ones on the road to suffer the consequences when a driver's brain fails to register our presence. Bicyclists often tell similar and even more fearful tales, and what's more motorcyclists can fail to notice human-powered two-wheelers for all-too-similar reasons. The solution requires gaining awareness, learning to perceive those sharing the road with us as humans, rather than merely threats. To lookout only for ones own safety is to ignore the responsibility we have to others on the road.